Click here to view historic sales data for Falcon. Scroll down to view the latest listings in Falcon. Falcon is located about 14 miles northeast of Colorado Springs proper and remains one of the largest communities on the eastern plains. The Falcon neighborhood includes the area to the south of the intersection of East Woodmen Road and Highway 24 and north of Highway 94. Thanks to affordable land with endless potential, Falcon home and business construction has grown exponentially, making the area a convenient and beautiful place to live. After Falcon's population boom throughout the 1990s, the area was split into two neighborhoods for home building and census purposes. Falcon encompasses the more rural areas of the neighborhood, while newer developments north of Highway 24 are collectively referred to as Falcon North. Just a short drive from the open plains, the retail center of Falcon lies along East Woodmen Road between Meridian Road and Highway 24. The Falcon Highlands Marketplace shopping center on the south side of Woodmen Road features all of the conveniences of any city, including a Walmart Supercenter, AutoZone, and UPS Store. Across the street, another storefront offers Safeway, Jiffy Lube, and O'Reilly Auto Parts. Fine dining options include China Recipe, Guadalajara Family Restaurant, and Frankie's Too. Add an abundance of fast food joints, convenience stores, and pharmacies, and it's easy to see why so many people choose open spaces near Falcon for their residence. Falcon offers recreational amenities, as well. The Rock Island Trailhead marks the western end of the 23-mile trail that runs along Highway 24 out to Ramah. Falcon Regional Park includes ballparks and open spaces, covering over 200 acres of land. Additionally, the unregulated area known as Coral Bluffs is an important site for paleontological research and offers unique rock formations for viewing. Motorsport enthusiasts can take a ride or just spectate at either Ram Off-Road Park or Aztec Family Raceway, while Dragonman's complex consists of shooting ranges, a paintball park, and a military museum. Falcon even has 9 hole disc golf course surrounding the DiscZilla Sports store location. School District 49 serves the students of Falcon and the surrounding area, stretching all the way to Powers Boulevard on the eastern side of Colorado Springs. With the vision of being the best choice in public education, District 49 is the fastest growing school district in El Paso County and works to foster academic, athletic, and social success through programs offered to all ages of students. Alternatively, the Pikes Peak School of Expeditionary Learning focuses on strong character, academic achievement, and social confidence in a charter school setting. 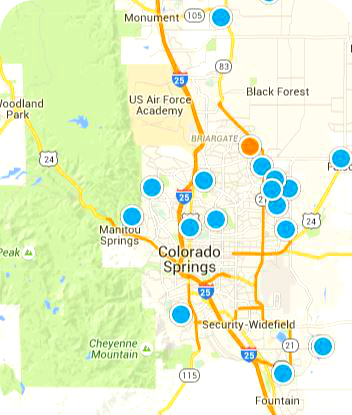 Through the choice enrollment program, many of the schools in the rest of Colorado Springs are available to students from any neighborhood, as well. Listing courtesy of Cornerstone Real Estate Team. Listing courtesy of Shawcroft Realty Inc.